Ewephoria is a nice, mostly bolted route up the North side of the dome. Though not as classic as Absinthe of Mallet or Stampede, its shorter length, many bolts, and easier rating make The Sheepshead more accessible. P1: Up the dihedral until a bolt leads out left, then up to a bolted belay. This pitch looks super-easy from the ground but is surprisingly harder than it looks. Gear: small to 3". P2: Move left for a move or 2, then up past bolts & small cams.Then climb up and right to a bolted belay just left of the gully. Do not go all the way to the gully. Gear: a few small-medium-ish cams. P3: Follow the tightly bolted line up a slippery slab to a headwall. More bolts take you up and right past the headwall. Run it out a bit on giant holds to a bolted belay amid the huge chickenheads. It is possible to get some gear by slinging chickenheads and/or large nuts/hexes between the plates. Gear: a couple big nuts/hexes and some long runners. P4: Climb straight up past more chickenheads, then up and right past bolts to a large ledge & comfy, bolted belay. Gear: 1 or 2 large slings or cord to wrap chickenheads. P5: The regular route then follows the large chimney on your right up to the top (the original finish for Absinthe) or for a much better option, finish on on Too Tough To Die, which goes at 5.8. To do this, follow bolts up from the belay to a huge chickenhead. Surmount this, then climb up and right past bolts on an exposed slab to the top. Gear: an optional large nut/hex for the big chickenhead. To descend follow cairns down and left to the obvious gully on the North side, then follow the trail back to the start. The first pitch is trad and takes pro to 2". The second pitch is mostly bolted, but pros with a couple of small to medium pieces in the crack. All other pitches are bolted. However, a couple of large hexes & nuts slotted between plates will help tame the runout on easier terrain on pitches 4 & 5. All belays are bolted. Take the approach trail to where it meets the dome at Absinthe of Mallet. Follow a trail left, contouring around the dome and working up until reaching the 1st pitch ramp/dihedral (see picture). Note that you can't see the 1st belay bolts from the ground. Climbers on the 3rd pitch. View of Sheepshead from the approach. High up the 1st pitch of Ewephoria. What are EWE doing up here? Thaddeus Portz right below the last bolt on P4. Climber on top of first pitch on Ewephoria. This Pitch is an awesome way to finish this route! 3rd Pitch of Ewephoria... My slab pitch! I've done this a couple times, and each time I am surprised at how slippery and technical I find the first pitch. After the first trad pitch, it's a relative cruise (except for one move off a ledge with a bolt that won't protect your ankles). Good clean fun, and the wild alternate finish is definitely recommended. The chimney is easier, but half scrambling and half chimney. It does have some bolts near the top of the chimney if you stay out of the back. i climbed this a few days ago and on the last pitch we climbed a bolted line that started at the base of the chimney and went up and left - clipping the last slab bolt on the Too tough to die variation. anyone else done this ending - i was curious about a consensus on the rating? I asked Geir Hundal today and he said about 5.8. Geir - thanks for the spectacular topo! The beta photo of the first pitch is worth bringing along: We spent awhile looking around before deciding the the bushy gully was the actual start. In fairness, the snow piled up at the base and lack of footprints didn't help us much either. My gear list: 1 ea, blue TCU, .5 and .75 camalot, 2.5 friend, 2 ea 1 and 2 camalot, 2 pink tricams. There were many opportunities for additional placements if needed. The moves on P1 aren't hard, but they aren't terribly obvious either. Thank you, Geir, for another awesome topo! Sweet intro to Cochise for me -- soloed it with no hitches and lots of fun in well under 3 hrs. NEW ALT FINISH/variation, "Ewephoria Direct" (5.11a/b TRAD): Stellar. At the end of the 2nd-to-last pitch, rather than crossing the dihedral onto the tree ledge belay, finish directly up. Follow the chickenhead highway up toward its natural end. 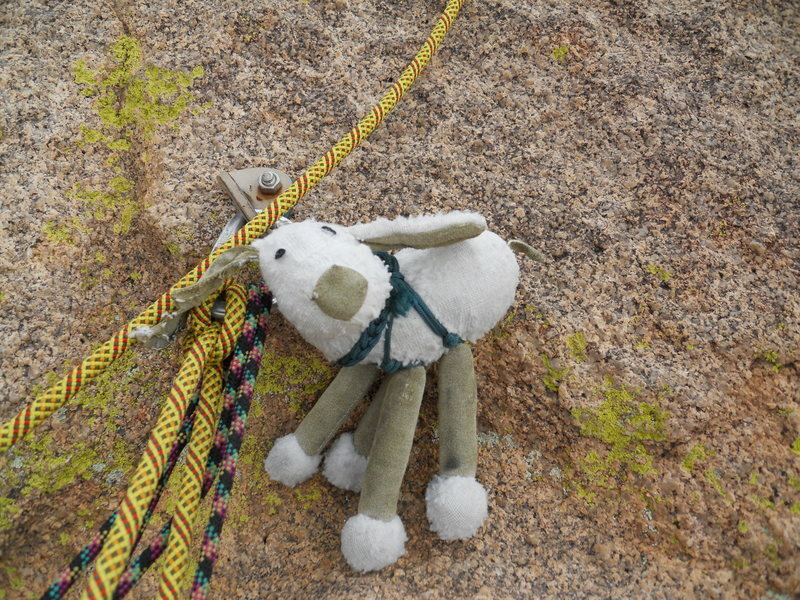 Then, depending on finishing plan, rope length, & drag, either belay here on chickenheads or in dihedral. Or (as I did, on 80m rope) continue up dihedral into & through roof/bulge (crux). Pull challenging 3-star sequence to get into hand-crack wedge and finger lock in lip of bulge and top out above this. Kinda rad & hard. You could either belay above the roof/bulge (#3 Camalot + bolt on Unknown to right(?)) or, for bonus points, connect as link up w/ Unknown 10+ to top. On Geir Hundal's topo, this would basically go straight up from "5.6R" thru "140'" and connect to "5.10c". Protects very well on gear. Upper part of dihedral (easy part) protects well with sequence of standard BD cams. There are multiple placements for smallest BD C3s in horizontal bulge. Booty Alert! I dropped a pink tricam from the anchors at the top of the third pitch. It landed in the trees directly below that anchor (to the climbers right of the bolt line on the third pitch). I did not attempt to retrieve it. If you find it and want to give it back I'll buy you a beer for sure, shoot me a PM. Or just keep it for yourself, you deserve it.